About The Service Program QuickBooks Compatible Software! Increase the communication within your company. Deploy mobile devices. Route more efficiently. Schedule work orders and service calls. How did The Service Program become the best tool for streamlining your service business? The Service Program was developed by Westrom Software, a privately owned software development company with more than 15 years of successful business application development experience. Founder and CEO, Bill Westrom, employs a wide range of IT professionals, flexible policies, and efficiently managed work practices that distinguish the company from firms offering similar services. Our customers have enjoyed using the business management software that we’ve developed exclusively for them, but we’ve learned that small and mid-sized businesses cannot afford a custom software solution. Thus, our development experience and industry knowledge led us to create a business management system that is accessible to smaller companies. Our software can be used in a wide variety of industries and it is generally accepted as the leading service business software program for pool service and maintenance companies, lawn care and maintenance companies, landscaping companies, irrigation companies, plumbing companies, HVAC companies, pest control companies, liquid waste removal companies, portable toilet and restroom rental companies, electrical contractor companies, equipment rental companies, property management companies, and other general service and route delivery businesses. - Quickly enter a service call or reminder to someone in your company and track lapsed time as well as when the work was complete. 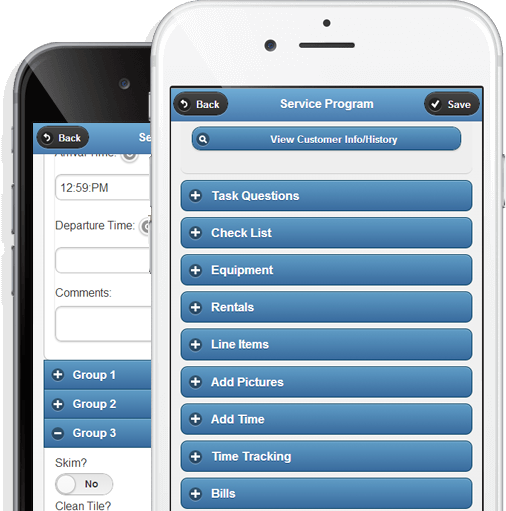 - Route drivers and service techs can enter tasks from their PDA to the office or themselves while in the field. - All tasks save to the customer history so you will always be able to see what has happened on an account. If you have a smartphone or tablet this information can even be viewed from the Mobile Solution! - Easily setup routes for drivers on any frequency you desire. - Our Map Wise Smart Routing capability will recommend what route and stop a new customer should be placed on, making the ability to keep your routes tight, a snap! - Analyze customer delivery frequencies based on a variety of factors including: average delivery amounts, number of refused deliveries, etc. 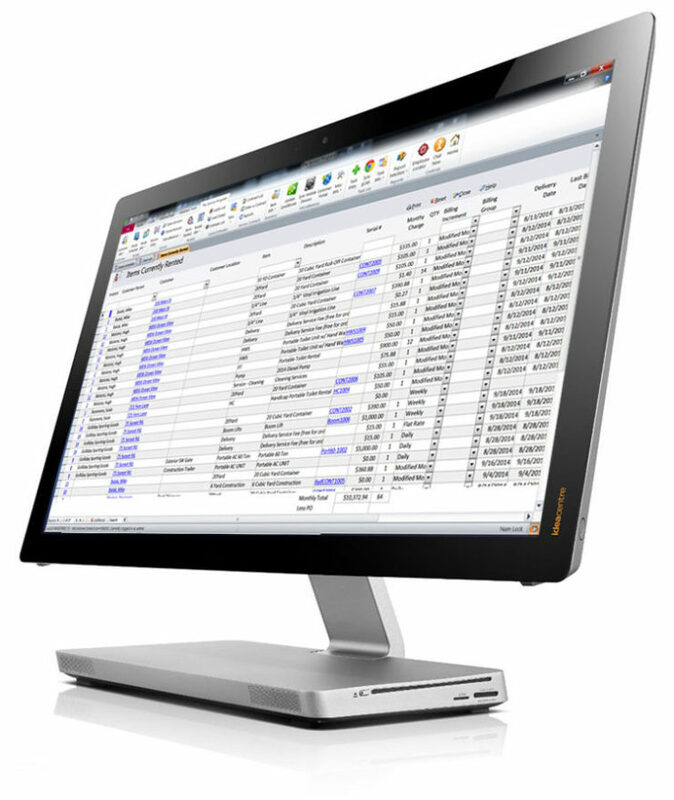 - Inventory posts directly into QuickBooks. - Manage multiple inventory locations, for example trucks, in The Service Program. - Track equipment and materials used on trucks for a job or route stop, including chemicals used and more. - The Service Program can provide leads in your area! Once the leads are imported or entered into The Service Program it will track calls, visits and much more. - Easily create a quote comparison for prospects that want to compare your price to their existing services prices. Once the quote is generated it can be seamlessly emailed to the customer. - Once the quote is accepted, The Service Program will: create the customer in QuickBooks, create various work orders to the appropriate people to prepare equipment, and generate the first order and more! - We can create a custom branded app with your logo in Apple iTunes and Google Play. - This is a great feature that increases communication between you and your customers. - Allow customers to enter a payment within the App and it will post directly into QuickBooks. Get information about the many benefits of The Service Program and how it can help grow your business.